Fans on both sides of the Bay may feud over their Giants or their A’s, but when it comes to the Golden State Warriors there’s a trans-Bay consensus: “The Warrior’s bring us all back together. And you are seeing that love today,” said a Hayward entertainer who calls himself Disqo Bui, joining thousands of exuberant revelers celebrating the Warriors’ championship season. 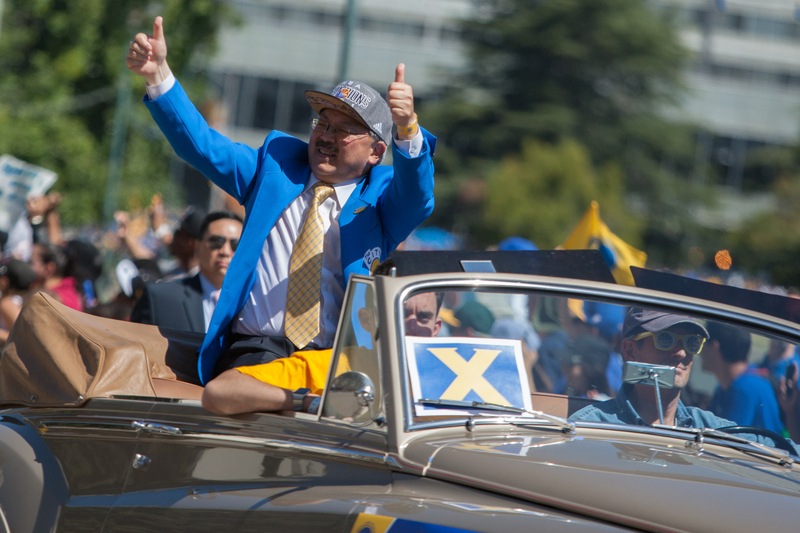 Police said as many as half a million people, packed the streets of Oakland June 19 to honor the Golden State Warriors, who two days before had clinched their first NBA title in 40 years. The streets were jammed and the sidewalks were impassable as the procession meandered the two miles from downtown Oakland to Lake Merritt, where a rally was held for the champions. Many in the crowd had been waiting since 5 a.m. in hopes of snagging a prime viewing location. BART officials said that about 552,000 people crowded into the trains, 150,000 more than ride the system during the week. But despite the crush and long lines at Lake Merritt station after the rally, there were no reports of delays or other problems. The atmosphere on the streets was electric. Police were concerned the day might turn violent, as have many recent protests in Oakland, but with one notable exception those fears never materialized. Three people were shot on the 1800 block of Lakeshore Avenue, alongside Lake Merritt, at about noon. Police said did they did not know the cause of the incident. Two of the victims were in critical condition and one was stable, poliice said the morning after the rally. Along with players, coaches, and staff of the champions, there were appearances from notable Bay Area residents, including rapper MC Hammer, who received cheers, and San Francisco Mayor Ed Lee, who was met with scattered boos. 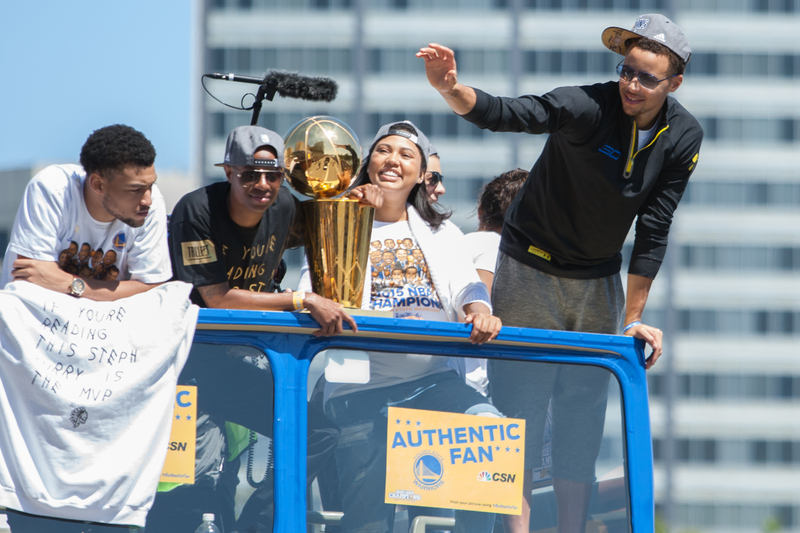 The loudest cheers of the day were reserved for the final double-decker bus and its cargo of MVP’s — Seth Curry, Andre Iguodala and the Larry O’Brien NBA Championship Trophy. This entry was posted on July 28, 2015 by Bay News Rising and tagged Andre Iguodala, Championship, Ed Lee, Edwin Lee, Golden State Warriors, Khaled Sayed, Lake Merritt, Mayor, Mayor lee, NBA, Oakland, Parade, Patrick Cochran, San Francisco, Steph Curry, The Warriors, Warriors.